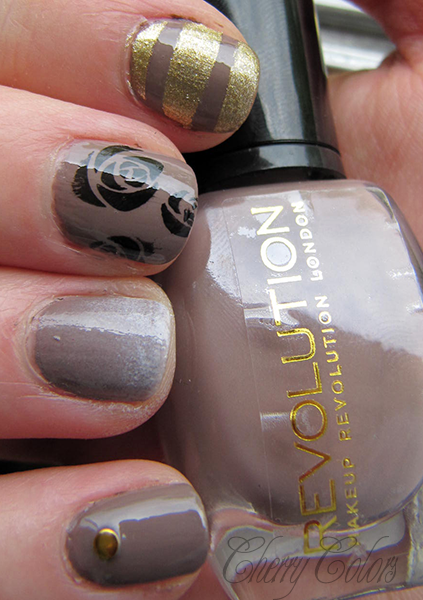 NOTD: Chocolate revolution - Cherry Colors - Cosmetics Heaven! I got the pleasure to receive a package from Ličila.si again. This time it was another batch of Makeup Revolution products, containing some new exciting add-ons to their store. I got a nice care package that also included this nail polish. I am not a fan of brown nail polishes, especially not in the middle of Summer, but I wanted to try it anyway (because I do not discriminate between nail polishes ;). I didn't know which polish to wear and since this one was waiting, ... well what more to say? I was really impressed by how quickly it dried. Really quickly, so quickly I had to do my layers fast or it would dry streaky! I used two layers and it dried in less than 10 minutes. Only love can set you free is the name of this brown nail polish. So I did some nail art :). First time using the tape and priming a stampy, too! You can get yours in the store (they are *very* cheap ~2€), here.